The idea of timelines has come up a few times recently, so it must be time to write about them. Timelines can be used as a tool for genealogists to arrange, in chronological order, all the information you have found on a particular ancestor or family. Doing so can often reveal missing information or wrong conclusions in your research. There are several ways to approach making a timeline. The simplest way is just to write out every detail you know about your ancestor. 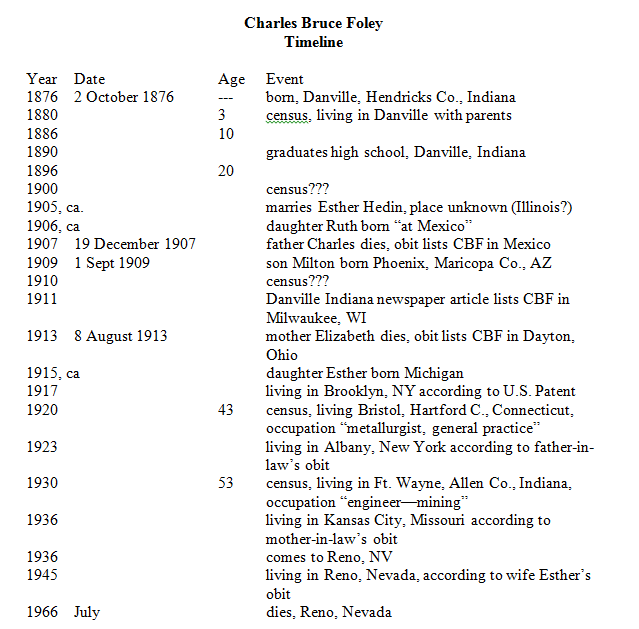 Here is a timeline of my relative Bruce Foley. I was interested in documenting every place he and his family had lived. You’ll notice I have questions and missing information noted, as well as sources for most of the facts. (Looking at this now, I’m embarrassed to say that I need to document every fact, not just “most!”) For further research I should find Mr. Foley in the 1900 and 1910 census. I continue to search for his place of marriage to Esther Hedin. Taking this simple timeline one step further, you could put it into a spreadsheet. A website called Genealogy Decoded has a free Ancestor Timeline Table with a place to document your sources. Follow the link here and click on Genealogy Worksheets. If you really want to put together an impressive timeline for your ancestor, you might want to use an online source or purchase software. About.com Genealogy and FamilyTree Magazine have some options for you. If you already own genealogy software, check and see if it has the option to produce a timeline from the information you have input. Finally, for something fun and educational, try OurTimeLines.com which lets you enter a birth and death date for an ancestor, then creates a chart with national and international events within those dates, to put your ancestor’s life in context. The next time you’re stuck on an ancestor’s research, try making a timeline of the person’s life with any of the methods listed above. Perhaps a piece of information will become clearer or you’ll see a new direction to take with your research.